I recently had the great pleasure of going to a double feature at my local multiplex, so for the first time since my review of The Hunger Games: Catching Fire I'll actually be talking about movies that are still in theaters (sort of). 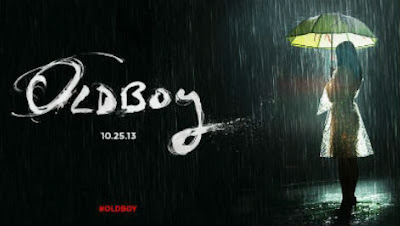 Oldboy is a psychological thriller from director Spike Lee, and it's the exact opposite of a feel-good movie. The film is dark, moody, and ominous, and serves as a cautionary tale against revenge. If you read my article on cinematography you know I think Spike Lee is an incredibly capable director, so while the story may leave you in tatters it does so very artfully and with a great deal of cinematic craft. While Oldboy is far from the best movie you'll see this year, it very well may be the year's best thriller. Joe Doucett (Josh Brolin) is an alcoholic businessman who values his job more than his estranged family. After losing a deal which would have saved his failing company, he goes on a drinking binge and wakes up in what appears to be an average, anonymous hotel room with one difference: there's no way out. While imprisoned, he learns that his ex-wife was raped and murdered and that everyone suspects him. Joe has made many enemies over the course of his life and has no trouble drafting a list of people who may have wanted him put away, but when he's finally released after 20 years the world has changed and the man responsible is the last person he would have expected. You know how I've been complaining recently about movies which would be fun if it weren't for their complete lack of character development or adequate storytelling? Oldboy turns all that around. Joe Doucett is a man torn in opposite directions by his need for revenge and his humility at facing all the people he's hurt. His character adds a layer to each action sequence: at the same time we're aroused by the violence of Joe's emotional release, we see what Joe doesn't understand until the film's finale (that he's only hurting more people). We learn that although he faced his demons in prison, he hasn't completely conquered them. The action simultaneously builds character. 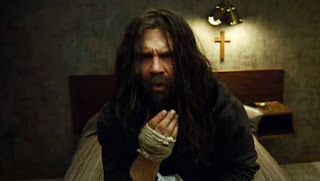 Joe's journey is expertly acted by an intense, fragile Josh Brolin and supported by equally skillful performances from Sharlto Copley and Elizabeth Olsen. Oldboy takes a page out of the cinematic techniques found in Spike Lee's other great thriller, Inside Man. Here the man behind the camera is Sean Bobbitt, a frequent collaborator with Steve McQueen and the cinematographer responsible for 12 Years a Slave, Shame, and Hunger. The few flashbacks in the film are shot with the characters who are looking back, so that when Joe tells Marie about his past we see the two of them walking through the memories with us. Beautiful and evocative still photography is often used to transition between scenes, an element which adds to the film's formidable sense of style. This is also enhanced by repeated symbols (e.g. tallies) which make the experience more cohesive and give it personality. The movie is also scattered with impressive and delightful long takes, an arguably antique technique in which I find endless pleasure. There's even a shot towards the end which tastefully violates the 180-degree rule, forcing Joe's sense of unease upon the audience visually as well as narratively. Perhaps more than anything else, Oldboy uses its strong characterization and dexterous cinematography to tell a cautionary tale about the morality of revenge. Joe is not a happy guy, but he thinks he'll find happiness by avenging his imprisonment and the death of his wife. While we can sympathize with his need for catharsis, we also see that he hasn't changed, that his vengeance further entrenches his destructive cycle. This is where the visceral violence comes in. Oldboy shows us how the most intense enjoyment is necessarily accompanied by a feeling of remorse. We regret our enjoyment at the same time that we take pleasure in it—pure enjoyment is never without its guilty, superegoic underside. Joe finally comes to understand this at the end of the film, and he attempts to remove himself from the vicious cycle of violence. Whether Joe's isolationism is the most ethical answer to this timeless dilemma is ultimately unclear. I guess I should probably take a second to talk about Chan-wook Park's Oldboy (2003). As you may have heard it is indeed also a movie, it has the same name and a similar story, and it came out before this, all of which would seem to qualify this new movie as a "remake". These "remake" things are always troublesome. While I can understand the inevitable comparisons made between the two, criticisms of remakes being "unfaithful" or "not as good" always come off as disingenuous to me. I love Chan-wook Park and I love the original Oldboy, but I could care less about the differences or similarities between the two. Spike Lee's Oldboy is a beautifully twisted and well-characterized thriller, and if you can't accept it on its own terms then I think you're not really watching. But maybe I'm wrong. This never got released for theatres in Australia but I'm hoping to get it straightaway when it's released on disc. I imagine it's a depressing experience, but I'm keen to see how the story unravels. With the original, I felt everything was about the twist, the mystery, but then, why not? Thanks! Why am I not surprised this didn't make it into Australia? Sorry about that, but you'll be glad to know that this isn't like Gravity, you definitely don't need to see it in theaters (although it does have some beautiful shots that I was glad to see on a bigger screen). And yeah, this is definitely the opposite of a feelgood movie, but it done so well it's hard to leave the experience in a bad mood. Hope you like it when it does come out! Oh, you totally should! Most of the critics give this movie a lot of unjustifiable crap, because they whine about it having nothing new to add to the initial 2003 Korean flick. Who cares! This movie is mind blowing. It tells a story with the same basics, but then gets creative from there. What is such a “boxoffice bombshell” about that. The camera angles, the character dialogues, the background, the plotting, and best of all, the fight scenes are all so slick and graceful. But they dog it just because the protagonist doesn’t eat a live octopus, and that his imprisonment, and ultimate fate are basically the reverse as Oh Dad-Su did in its predecessor! Injustice!!! Ignore them, com padre. See this remake. You know that old cliche about how remakes are to movies what diet sodas are to the regular ones? Oldboy (2013) is most definitely NOT one of them!